For this latest release, we added a bunch more categories to the Add Bookmark page. We copied the category list from Google Adwords as it seemed as good a list as any, and we’ve since it used in other marketing products. 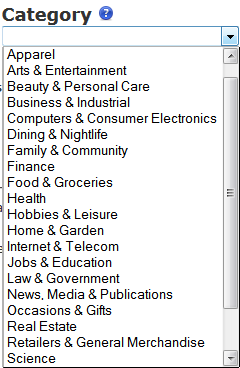 We had to remap a few of the old category codes to new ones, so don’t be surprised if you go to edit your bookmarks and see different categories. We’ve done our best to make the mappings make sense, but if you don’t agree all you have to do is edit/update your bookmarks. We’ve just rolled out some more changes to SocialAdr! SiteSays social bookmarking service added. Faviki social bookmarking service added. They’re pretty interesting as they use Wikipedia-concept tags, rather than just allowing anything and everything. Jumptags social bookmarking service added. Gravee social bookmarking service removed. This is hopefully temporary…it seems that their site is infected with a trojan so nobody can register and it sets off virus scanners. Propeller social bookmarking service removed. They didn’t seem too keen on the type of bookmarks coming from us – as they’re more of a “News” site – so we thought it was best to respect their wishes. Improved the Setup Wizard for Delicious–Yahoo linking to make it easier to use.